Keep your living space simple yet elegant with the Alpha 4-piece sectional from the Two Lanes collection. This versatile design offers T-style seating, plush loose back cushions and gently flared track arms. 8-way hand-tied springs and feather blend-wrapped cushions provide comfort and lasting support atop a kiln-dried hardwood frame. 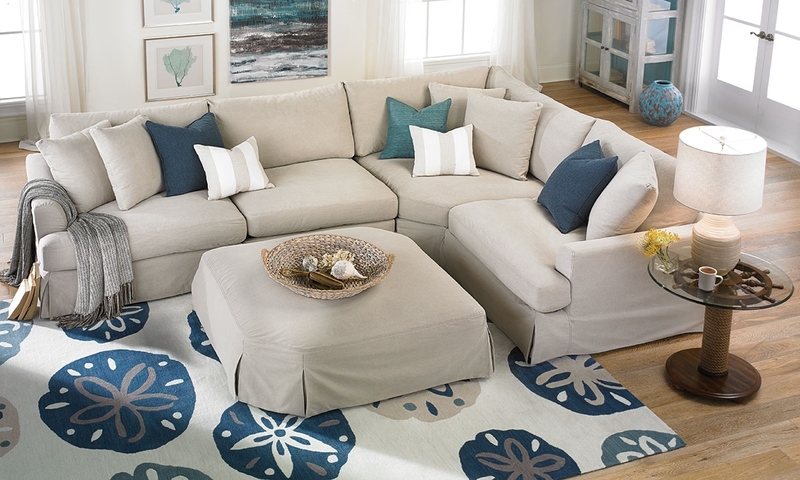 Its removable, cleanable slipcover completes the breezy coastal cottage look while also offering peace of mind. Slipcovers can be special ordered in more color and fabric options, including LiveSmart stain-resistant upholsteries perfect for families with active children and pets. Ottoman also available. See store for details.